Rosewood offers animal-assisted therapy to aid in the process of building trust, promoting emotional healing and supporting lifelong recovery. Animal Assisted Therapy (AAT) is one of our most popular and effective experiential modalities. The program lets patients interact with horses, goats, and even fish under careful supervision by trained handlers and therapists. Animals can sense, exhibit and respond to humans on an emotional level. They can form bonds with humans. Over time, an animal learns to recognize a human. They have their own agendas and ways of communicating. There are also some key differences between animals and humans, which can be helpful in a therapeutic sense. Animals accept humans on their own terms, unconditionally; humans often place conditions on relationships. They don’t behave in ways that can inadvertently cause harm to others. They don’t hold humans to an artificial standard of beauty or behavior. Domesticated animals also have physical needs, which they depend on humans to meet. Unlike animals in the wild, they are not naturally suspicious. Just the individual acts of feeding, grooming and generally caring for an animal strengthen a bond that runs deep. That bond works both ways. There’s something undeniably satisfying about knowing you’ve met the needs of an animal that has come to trust and depend on you. All animals at Rosewood have special training, and AAT activities are always supervised under the watchful care of equine professionals as well as our skilled therapists. AAT is available to nearly all patients at Rosewood. 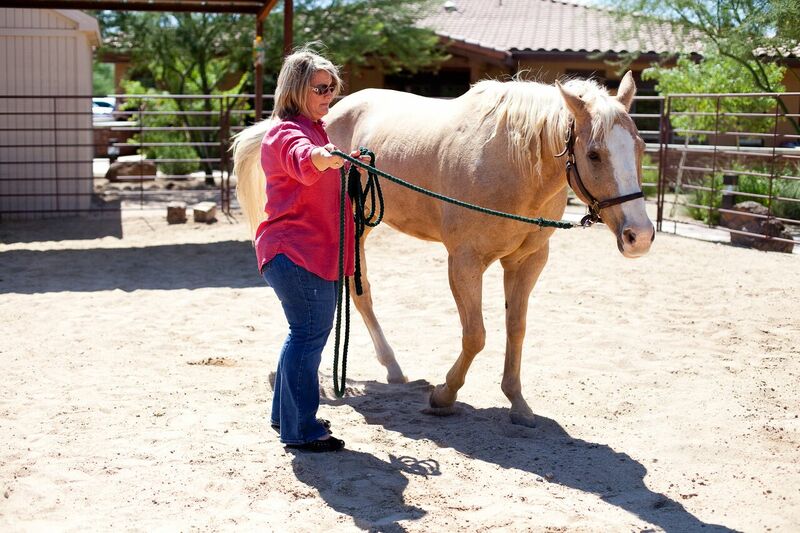 Equine therapy must be approved by the patient’s multidisciplinary team and entails a degree of physical activity. Interaction with goats is available anytime as long as staff member is present. The only contraindication for AAT is if the patient has an allergy. In our AAT program, patients have opportunities to strengthen many of the concepts we emphasize in therapy—including self-nurturing, boundary setting, accountability, responsibility, self-confidence, self-control, problem solving skills, assertiveness, empathy, and emotional awareness. AAT helps patients recognize their own distorted behavior patterns, and shows them, in very real terms, how it feels to experience a healthy trusting relationship. Self-nurturing: When patients nurture an animal, they become more aware of their own need for self-nurturing. It reinforces the fact that we all have a right, and an obligation, to nurture ourselves. 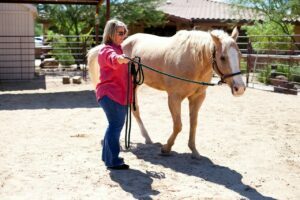 Transfer of trust: If a traumatized patient is given an opportunity to interact with a horse, it helps the patient open up a dialog with the therapist. The patient learns to trust the therapist because they trust the horse. Assertiveness: When a patient is first asked to lead a horse, the horse senses the patient’s lack of confidence and goes where it wants. Soon, with practice, the horse accepts the patient’s leadership, and the patient develops the assertiveness and self-esteem needed to lead the horse successfully. This exercise demonstrates how to be assertive in relationships with others. Protecting the support network: In this psychodrama exercise, several buckets of food are placed in front of the horse. Each bucket represents a source of support for the patient (friends and family members, for example), and the hose represents the eating disorder. The patient can’t keep the horse from devouring the food in each bucket, in the same way an eating disorder “devours” the patient’s most cherished relationships. The patient gains an understanding of the damage caused by the eating disorder, learns to transfer their anger onto the eating disorder, and take ownership of protecting important relationships. Overcoming fear: Because of their size, horses can be intimidating. For a patient, approaching a horse in small steps can be like approaching a fear of confronting an eating disorder. The patient learns to overcome their fear in small steps: first by walking toward the horse, then touching, stroking or brushing the horse. Overcoming a fear of horses can help patients overcome fears about treatment.